Wyndham is a small town in the Kimberley region of Western Australia. It is split into two parts, the old town, and port, is on the banks of the Cambridge Gulf, and the main residential and retail area in the plain a couple of kilometers away. Wyndham, some argue, is the hottest town in Australia. Although it doesn’t have the highest peak temperature, the honour which belongs to Marble Bar, it does have the highest average temperature for the most days each year. In 1946, Wyndham recorded 333 consecutive days where the temperature reached over 32 degrees. Wyndham is home to a few attractions, including a huge concrete crocodile which celebrates the many crocodiles that call the surrounding waters home. Its not as spectacular as the the one in Carnavon but the kids thought it was pretty cool none the less. The best place to see crocodiles is at the Wyndham Crocodile Farm. There are several Boab trees nearby, including a “prison” Boab which was used to house prisoners overnight. There is a Boab in the Caravan Park that is over 2000 years old. You can also head up to Five Rivers Lookout, at the top of the Bastion, a hill that overlooks Wyndham and the five rivers that drain into the Cambridge Gulf–the Ord, the King, the Forrest, the Pentacost and the Durack. The best time to drive up here is on dusk. Leave the caravans at the bottom or in the caravan park. The first time a European visited this area was in 1819. His name was Phillip Parker King, and his instructions were to “find a great river, likely to lead to an interior navigation into the great continent.” He sailed into Cambridge Gulf, and then up the King River, which was named after him. He then left, after finding no fresh water on the coastal mudflats. The town was founded by John Forrest in 1886, after gold was discovered at Halls Creek. Six months later, the town was booming. There were six pubs, and up to 5,000 miners were brought in by ship. However, by 1888, the gold rush ended, and Wyndham’s fortunes dwindled. The town was instrumental in the construction of Kununurra and the damming of the Ord River. 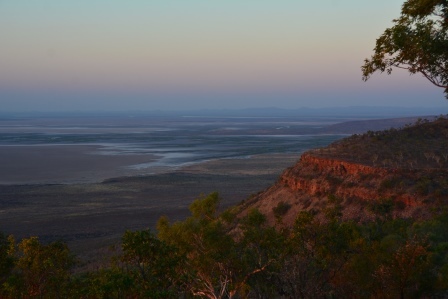 After Kununurra was founded, it supplanted Wyndham as the population centre of the area. Today, Wyndham has a population of around 800. It serves as the regions port, shipping ore from nearby mines. From Darwin, take the Great Northern Highway west. After Kununurra, turn right onto the Great Northern Highway to Wyndham. Getting to Wyndham is pretty easy. 100 km from Kununurra and about 933 km from Darwin, it’s bitumen and highway all the way–so you can set your cruise control and relax. It’s pretty far into the outback, but all things considered it’s not too far from Darwin relative to where you could be going. 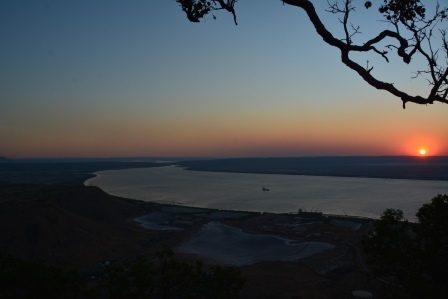 The best time to visit Wyndham is during the dry season, from April to early November. During this time the average maximum temperature of 31 degrees. In the wet season, from late November to April, the average maximum temperature is 39.5 degrees. Wyndham is home to two hotels, as well as the Wyndham Caravan Park. 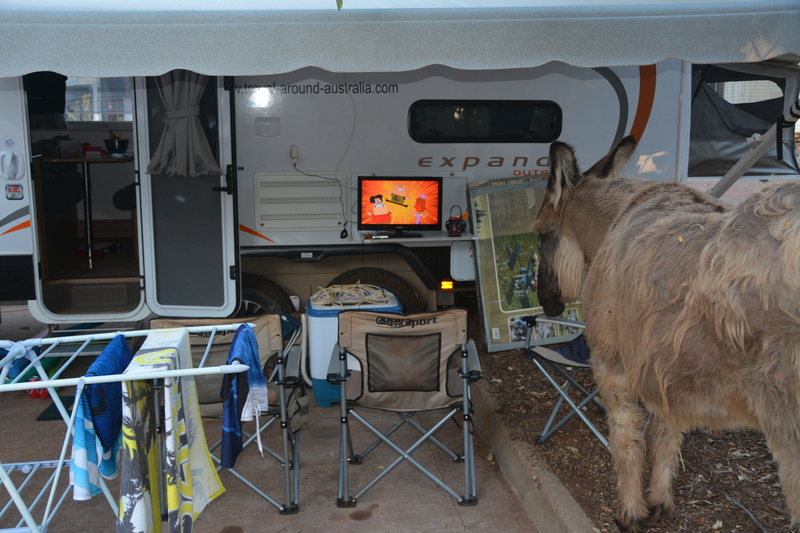 The Caravan Park is pretty relaxed and has a very cold pool to swim in. There are also a few free camps around the area. There’s quite a large aboriginal population in Wyndham. Check out the statues in town that the locals have created. They are worth a 10 minute visit. The place feels a bit old and run down however the view from Five Rivers Lookout is worth a drive in. Stay for a night or two but you will be hard pressed on finding activities for a longer stay, unless you just want peace and quiet. The Five Rivers Lookout. We didn’t like much else about the place. 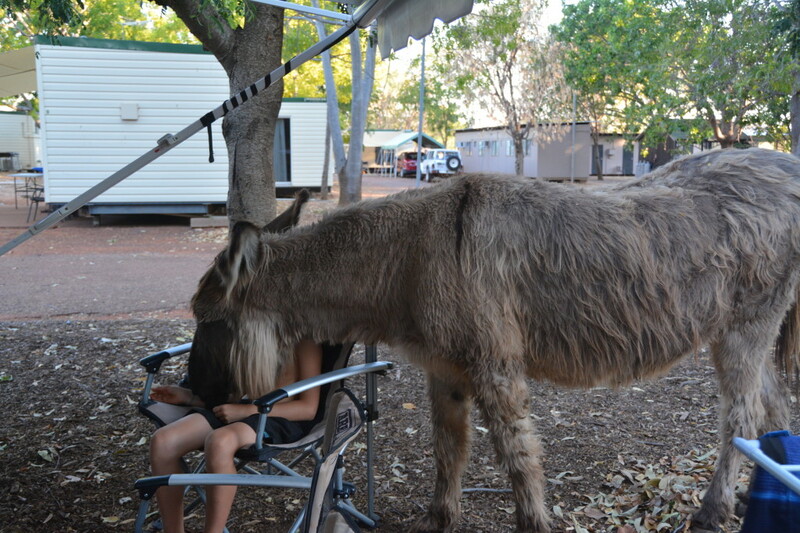 The boys loved the donkey that lives in the Caravan Park. Except the time when it stole Lachie’s sandwich from his hand when watching tv. The boys complained that the pool was too cold in the Caravan Park. We only stayed a night in Wyndham so we didn’t really get to dislike anything about the town.